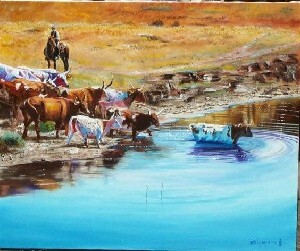 Description: A cowboy heards longhorn cattle into a lake for the longhorns to cool off and get a drink. Born & raised in So. West Philadelphia, Bill is mostly self-taught. Art has been a part of his life since he can remember. He has done set design for little theater and murals for restaurants. His artwork hangs in the homes of CEO's and celebrities all over the world. His work is in corporate collections and in restaurants. Art has always been a part of my life. I try to communicate with my artwork, I try to open up the eyes of those around me and show them that sometimes you look but you must learn to "SEE". All of the world is my canvas and the paintings are there and it's just a matter of me finding them and bringing the out for you to see. The paintings are all over and the subjects are only limited to your imagination.